An extension to the church or a separate building intended for baptism. Inside the baptistery there is a baptismal font, usually large enough to accommodate an adult, or even a few people. Baptisteries are known not earlier than the IV. And initially were quite large. Often they served for the preparation of those preparing to receive baptism, and sometimes for the assembly of the Christian community. To immerse, water, water; To draw; wash.
A water tank for washing (Twilight) for the purpose of purification from ritual uncleanness. The rite of baptism appeared not from scratch. It is no accident that the Jews were baptized by John the Baptist. 907βαπτiζω- immerse, water; To draw; wash.
(heb. מִקְוֶה‎, literal Accumulation of water) - a water tank for ablution (Twilight) for the purpose of purification from ritual uncleanness. The rite of baptism did not come from scratch. It is no accident that the Jews were baptized by John the Baptist. (lat. baptisterium, "baptize", baptismal, baptismal) - an annex to the church or a separate building intended for baptism. 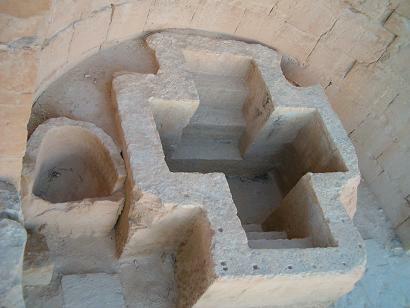 Inside the baptistery there is a baptismal font, usually large enough to accommodate an adult, or even a few people. Baptisteries are known not earlier than the IV. And initially were quite large. Often they served to prepare those preparing to receive baptism, and sometimes for the congregation of the Christian community. Another slippery question is baptism. Do I cross if you were baptized as a child or not? The Orthodox Church teaches that baptism should be done in childhood, and evangelical churches teach that the decision should be made by the person himself, and not by the will of the parents. My answer is simple. I was baptized in infancy, but was baptized in adulthood. Both baptisms are important to me. If I had not been consecrated to God as a child, I would not have served Him now. So, our circumcision is baptism. By the commandment of God, it is necessary to cut every baby of the masculine gender on the 8th day. Jesus was circumcised on the 8th day and was not opposed to what his parents had done. And no Jew does not mind. I do not mind that I was baptized as a child and I do not know anyone who would be against being baptized as a child. Jesus himself was baptized in adulthood. It is clear that in my infancy I could not promise God a good conscience. But after all, sometime it is necessary. What to do, after all, we came up with the idea that baptism can be only one thing, not to deviate from our traditions. Because and there are rites like confirmation. People are so afraid of the second baptism. But let's look at the roots of baptism. Josephus Flavius ​​"Judean Antiquities" book 18 ch.5:2 Tiberius gave this order to the Syrian governor. Some Jews, however, saw in the destruction of Herod's troops quite a just punishment from the Lord God for the murder of John. Herod killed this righteous man who urged the Jews to lead a virtuous life, to be fair to each other, to feed the pious feeling to the Eternal and gather for ablution. Initially, the Jewish mikvah, in our baptism, was not a one-time act. just sprinkling water, without full immersion. Among other things, it's saving water in those places. I live in Lapland and we have little where the water warms up enough to be baptized in an open reservoir. So we need to go out for this? Like His commandments are not heavy. Amen, not heavy, you just need to listen to people less. And if a person can not physically be baptized on the street? I was baptized both on the street and in the pool and in the bathroom. I can not say that the baptized in the lake turned out to be more stable Christians. If you have your own church premises, where it is possible to have a baptistery. Great, but not all have this opportunity. The main thing is water. So, what is needed for baptism, except water? Believe. What can impede? Philosophers who do not know the Lord. Someone deliberately does not immerse at baptism, so that people do not have the illusion that water saves. How many mystics people are looking for in Christianity. When I am asked, and I was baptized "with full immersion or not with full? ", I answer: "and you had a full consecration or not complete?". People forget the spiritual part, making baptism something empty, the cause of disputes and divisions. Literally translated as "Flowing out of Dan." The tribe of Dan was on Mount Hermon and there the river Jordan originates. The Upper Jordan flows into the Sea of ​​Galilee (Genesaretskoye in the Russian tradition). Lower Jordan flows from the Sea of ​​Galilee and flows into the Dead Sea (in the Bible it is called the Asphalt Sea). There are 2 supposed places for the baptism of Jesus on the Jordan. For certain we know that He was baptized in the Lower Jordan. In Matthew 3 it is said that "John the Baptist and preaches in the wilderness of Judea" and there he baptizes. This is and is understandable. There was an Essex community, to which John was generally referred. It is also unlikely that the Jews would go to Galilee. And from Galilee it was normal to visit Jerusalem. 1Pet.3:21 Then Jesus comes from Galilee to the Jordan to John to be baptized by him. This is the first supposed site of the baptism of Jesus. The 2 nd place in the immediate vicinity of the Sea of ​​Galilee. The fact is that the Jordan is a fairly small river, rather a stream in our understanding. The election of the place of baptism in the Bible is explained "there was a lot of water". So there are 2 places where there is a lot of water. The Bible speaks of what was before baptism and what happened after. Before baptism, everything happens in Judea. After - everything happens in Galilee. Who, when, where did he go? The fact is that the Jordan is at the junction of 2 plates, which are constantly moving. And today the Jordan is not the same as it was in the days of Jesus. They say that you can not enter the same river twice. All flows, everything changes. The state border of Israel with Jordan runs along the Jordan River, which means that not only can it not be approached, but it is not even visible. You can only drive along and see the valley of the Jordan. Access to the river can be found in Israel only in the north, and in Jordan in the south. Both countries want to earn on pilgrims, because today there are 2 places for the baptism of Jesus. People who are baptized in the Jordan are nevertheless blessed, because they devote time to think more deeply about Jesus, to seek Him, and to those who seek Him He rewards.